"You could deliver a cracking round route for horses"
Here we are, upgrade another short stretch of footpath, and one farm track, and you could deliver a cracking round route for horses - with 3000 supporters this could be delivered in no time at all. "The BHS have flown in the face of their own surfacing advice." The BHS have flown in the face of their own surfacing advice. I think it was one of the other discussions on here where I believe the ex West Sussex BHS access rep said she was baffled by the decision (my words). Perhaps as the local BHS access rep is in fact a carriage driver and a harder surface actually benefits them. Perhaps I'm being a little sceptical. Funny, I've read enough of the PD campain over on the ST forum to know that at best it's trail sanitation. I can't really comment on the Swinley situation beyond speculating, I've not heard too much about that. "What is being done and why?" I live in Warnford and regularly use the disused railway line to West Meon as part of a circular walk. In the past few weeks extensive tree felling has been carried out at the West Meon station site and this is now working southwards, with the sides of the cutting leading from the station being clear felled. 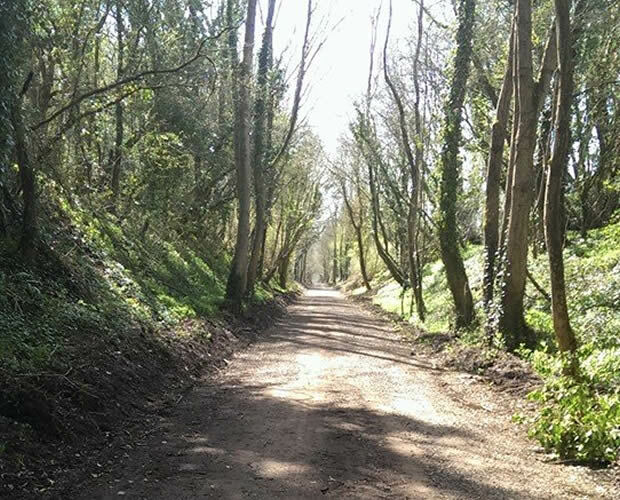 A little research identified to my disgust that this is because the Meon Valley Trail is being "upgraded" at a cost of £310,000 by SDNP and Hampshire County Council. Can anybody direct me to information about what is being done and why? I am particularly interested in how far this destruction is going to extend and whether it will reach the beautiful section between Hayden Lane and Exton. Will the trees along the railway here be felled as well? I recall filling in a questionnaire on this website about the upgrading a year or more ago, with the promise of further consultation, but this has not happened. "Think how much clearing of mud was done. It is all going to come back"